PM orders National Security Council to deduct money from Israel's tax transfers to PA to compensate farmers affected by 'kite terror'. Israel is preparing to fine the Palestinian Authority over a series of recent arson attacks on Israeli property near the Gaza Strip, deducting tax money collected by Israel for the PA in order to compensate farmers harmed by the attacks. Since March 30th, Gaza rioters have clashed with Israeli security forces protecting the frontier with the Hamas-ruled Gaza Strip. Along with attempts at mass infiltrations into Israel, some rioters have sought to cause financial harm on Israeli farmers near the Gaza Strip by intentionally sparking fires on Israeli agricultural land. Using kites carrying improvised incendiary devices, dubbed “terror kites”, the rioters have managed to cause serious financial losses for some farmers whose property lies near the Gaza border. On Sunday, Prime Minister Binyamin Netanyahu instructed Meir Shabbat, chief of Israel’s National Security Council, to deduct money from the taxes collected by Israel on behalf of the Palestinian Authority. Each month, Israel collects income tax from PA residents working in pre-1967 Israel. The funds are then transferred to the PA. Under the arrangement laid out by the Prime Minister, Israel will deduct from those tax transfers any monetary damages incurred by the recent “kite terror” attacks on Israeli border communities near the Gaza Strip. 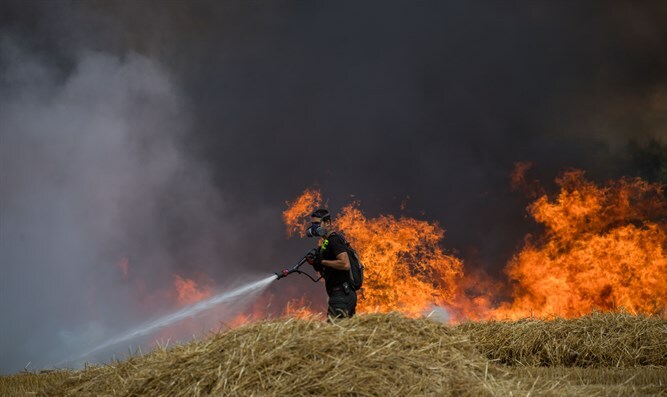 Israeli farmers and others impacted by the arson attacks will be compensated with money deducted from the PA taxes collected by Israel.